Hey there, my name is Ping - I'm named after the computer utility. I have a lot of nicknames, including Ping-a-ling, Ding-Dong, Monks (short for Monkey) and Gracie (after Gracie Lou Freebush, because I wasn't very graceful as a pup). I was born on August 19, 2005 in Virginia and I moved to Victoria when I was four months old. 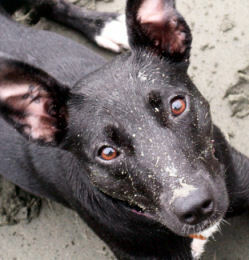 I'm a borderstack, from a staffy-jack russell mom and a border collie dad. I live in Chilliwack with my humans Sheri and Jonathan, and my canine siblings Savvy, MoJo, Salem and Jenga. My mom became involved in flyball in January 2003 with a previous dog and I guess she was hooked. 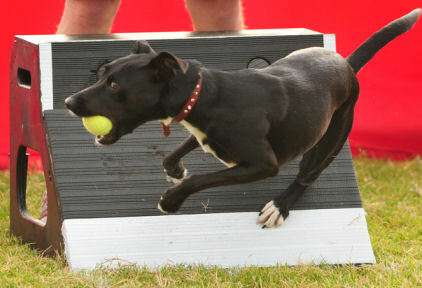 It was just natural that she would train me in flyball too. Lucky for her I enjoy it! The toughest part for me about learning flyball has been staying focused on Mom when there are strangers around our practice area. I don't like strangers, so I will go tell them off in my "big voice". I'm not sure why, but Mom doesn't seem to appreciate my hard work. What has made Mom most happy though, was September 17, 2006 when I did my first full run for tournament points and didn't lose my head. I'm still building my confidence in the ring, but so far I have an average time of 4.6 seconds and a best time of 4.25 in start position, 4.43 in the pack! When I'm not at flyball, I like to RUN! One of my favourite things is pulling the dog scooter! I also love disc, dock jumping, and this fun new dog sport called nose work. I have a lot of neat tricks, but my favourites right now are jumping up to give kisses, and speaking in my staffy voice. When I'm ready to chill out, you'll find me whereever there is a patch of sunshine or a warm blanket.